Citation Information: J Clin Invest. 2002;110(7):1011-1019. https://doi.org/10.1172/JCI15276. Generation of a conditional IGF1R knockout in β cells. (a) A diagram of the Igf1r locus around exon 3 (filled square) is shown, followed by diagrams of the null (Igf1r+/–) (41), floxed (Igf1rlox) (42), and recombined floxed (Igf1rΔlox) (42) alleles. The positions of the P1, P2, and P3 primers (arrows) used for genotyping are indicated. (b) PCR analyses using DNA from islets and control tissues. The lanes labeled – and + correspond to the negative and positive controls. Primers P1 and P2 yield a product of approximately 120 bp in WT and null Igf1r alleles, and 220 bp in the Igf1rlox allele. In the Igf1rΔlox allele, excision of exon 3 enables amplification to occur between primers P3 and P2, yielding 320 bp. In the lanes to the right of the markers, DNA from different tissues of Igf1rΔlox/– mice was used. Br, brain; Li, liver; and Ki, kidney. (c) Western blot analysis of IGF1R expression. We obtained protein extracts from wild-type mouse embryonic fibroblasts or from fibroblasts derived from Igf1r–/– mice as positive and negative controls (first two lanes on the left). We purified islets from wild-type (third lane from the left) and Igf1rΔlox/– mice (right lane). 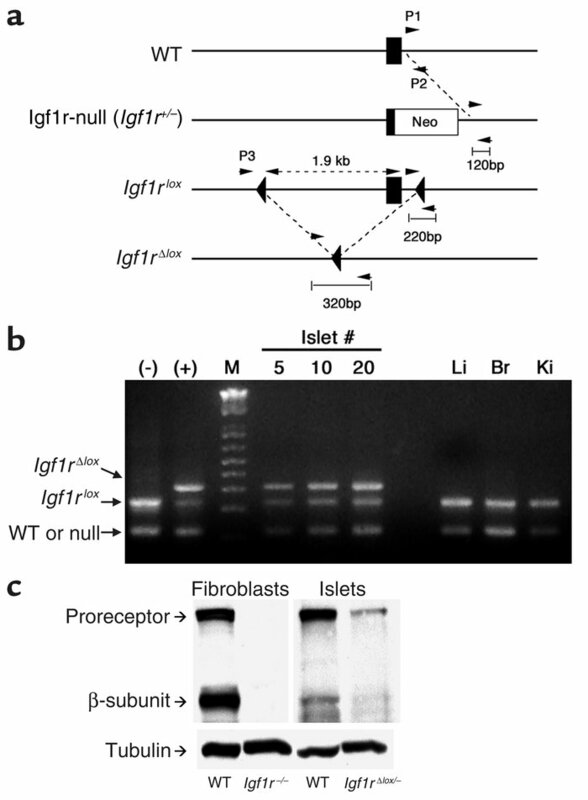 Following detection of IGF1R, the blot was stripped and reprobed with anti-tubulin antiserum. The position of the various bands is indicated on the left of the autoradiogram.